I saw that juicer at crate and barrel, I am gonna go to bed, bath and beyond now so I can use my 20% coupon 😀 woohoo!!! I have been wanting a juicer for so long!!! The Breville comes with some great recipes. That’s where I got the one in the blog. Watching my dvr of TB right now, I hope it gets better than this. Kind of disappointed in it right now! Hey Tracy it is so great to hear you happy and positive. It makes my heart feel happy! 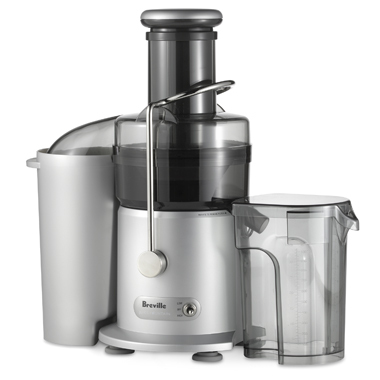 I’ve always wanted a juicer and researched them in depth at one time. Even bought a couple of books (I buy wayyyy to many books!) on the benefits of juicers and recipes. Is it really that easy to use and to clean? Do you think you’ll use it lots? I’ve never known anyone that had one…so baby I got questions!! So glad to hear your happy voice! And I might even watch True Blood. I bought the first season and loved it. But then I heard that the second season was weird…so I didn’t get it. Was that a mistake? Hi Kathy!! TY and I’m hoping to keep this feeling going! So far, I love the juicer. I was nervous about the cleanup, but it was easy. If you clean right after making, it’s basically just a good hot rinse. Carrots, I’ve heard do stain them. But, I’ve heard that for all the juicers. The motor is awesome. There are two speeds on this one, I only have needed to use the low speed. And it takes whole apples. [it says] Have not tried that yet. 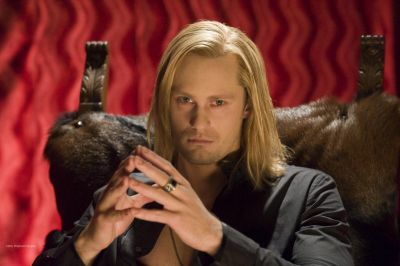 It does get weird in True Blood, but it is a weird show. It is good. I’m watching the premiere right now of season 3 and so far am not impressed. Hoping it gets better!! Thank you Tracy, I might order It online, If It’s not the same one at C & B. I will check again this week.